November is a time for voting, falling leaves, comfort food, warm clothes, and Thanksgiving. 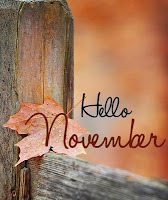 What is November like in your country? Soon we will begin practicing our irregular past tense verbs. Try this Quizlet to see how much you already know. There are many opinions about getting the flu vaccine (flu shot). Reading an article about a new drug recently approved.